Baum Squad: The Baum Family Blog: Today is a good day. First, I wanted to thank you all for your ideas, suggestions, etc. about Lilly's rash - both the one on her neck and her diaper rash! I got a TON of responses via Facebook, e-mail and blog comments. I may do a follow-up post at some point later in the week to consolidate all of your suggestions so that everyone can see them for future use. I especially got some great ideas on the diaper rash. For the rash on her neck, quite a few people - my Mom and Granny included - suggested corn starch, so I went for it. It sucked the moisture out and dried that rash right up within a few hours! I will definitely be keeping my container of Argo in my baby supplies basket on the changing table for lots of future use. Thanks again! So, down to business. We have been in major preparation mode for Lilly's upcoming baptism. There are quite a few things that we've been meaning to do around the house, but you know how it goes - time always seems to get away from us. SO, with this baptism coming up, we are going to have quite a lot of family and friends in town, and we are SO excited. It has also "lit a fire," if you will, for us to get some things done around here! There is a never ending list of decorating items that I keep meaning to get to - I always seem to get overwhelmed, so at some point I am going to tackle one room at a time and not move on until that room is done. I think it will save my sanity, and spread out the damage that I'm sure will happen to the bank account. ;-) At the top of my list is Lilly's nursery. There are a lot of small projects that need to happen in there, and while I'm sure it won't be 100% completed in two weeks, I wanted to do a few things before our guests arrive so that we could show it off. Since the yard is closer to meeting Dan's standards, after church and brunch today, Bill & Susan offered to watch Lilly and give Dan and I time to do anything that we needed to. 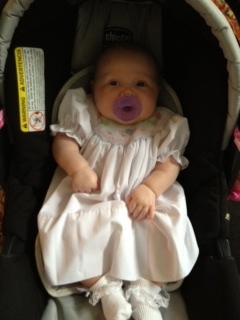 Lilly's pretty church dress! Couldn't get her to cooperate sans paci but wanted Grandmommy to see how pretty she looked in her gift! We decided to take them up on their offer and headed out to run some errands. I have been in search of a cool frame for months to use for a project in Lilly's room, and the problem I've been running into is that nothing I've found matches what's in my head. My original idea was to use said frame to create this bow holder. However, my sweet niece Erica gave Lilly a super cute bow holder at one of our showers, so I decided that I wanted to make it into a mirror to hang over her changing table instead. We ran to the flea market at the fair grounds today in search of a desk chair, and behold, I found my mirror!!! I'll post pictures of the finished product when I'm done crafting it up. :-) I am so excited and can't wait to see how it turns out! After the flea market, we went to Lowe's to get supplies for my craft. We didn't find what we were looking for, but guess what we did find? Yep, you guessed it. A CHEST FREEZER FOR THE GARAGE! I have been BEGGING for one of these suckers for several years (Know how I know I'm getting old?) and Dan kept saying that we didn't need it and didn't have room for it. The time has FINALLY come when my breast milk has taken over our entire freezer in the house, so I was able to convince Dan that we truly need it. We are now the proud owners of a freezer to store aforementioned breast milk and also a cow. WAHHOOO! So, we've been busy bees around here as you can see. Several more projects will (hopefully) be completed over the next two weeks. I'm okay with it, because as I mentioned before, they're all things that I've been meaning to do for the entire year since we bought this house. Maybe I will finally have it the way I want it by the time we are ready to sell it however many years from now. Ha! Hope you all had a wonderful weekend! Stay tuned for updates on project completions, and hopefully at some point in the very near future, the nursery reveal. And don't forget to vote!